To celebrate Jeffrey Herlings’ outstanding FIM MXGP Motocross World Championship title win in front of his home fans in Assen, The Netherlands, KTM is excited to announce the launch of a special edition motocross model the KTM 450 SX-F HERLINGS REPLICA. Herlings has truly endured the highs and lows of motocross dominating the majority of races during 2018 despite sustaining a collarbone injury mid-season. The 24-year-old clinched his first FIM MXGP World Championship victory at the penultimate round of the series and has gone on to achieve an incredible 14 1-1 moto finishes so far this season. 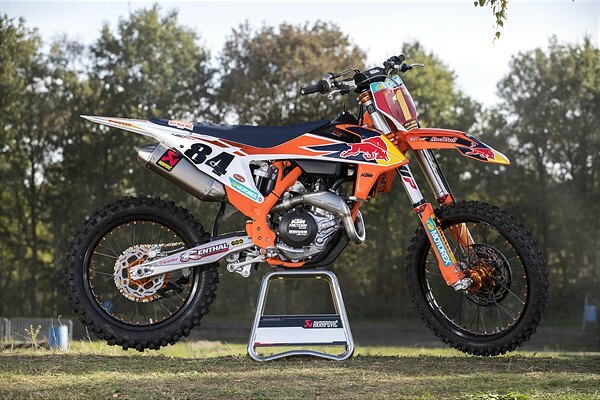 The KTM 450 SX-F HERLINGS REPLICA was unveiled by the four-time world champion during a media event in Valkenswaard, The Netherlands – the venue of many victories for ‘The Bullet’. “I was so pumped when I was told there would be a KTM 450 SX-F HERLINGS REPLICA. I’ve been with KTM all the way through my career, and we’ve worked through the hard times and celebrated a lot together – we are a family, not just in the paddock, but back in Austria too, so this bike is really special to me. This year has been incredible for us with the results, and even with the injury I was able to come back strong and win the championship. To do it in front of my home crowd was amazing. It’s an honour to have a bike out there replicating my race bike – I hope the customers out there really like it,” said Jeffrey Herlings. “Jeffrey’s season is a great story and he has been outstanding – we are proud to see him take the FIM MXGP Motocross World Championship title win. Towards the end of last season he was so strong, and also winning the race in America was a highlight for him, but this year has just been immense. Following on from the CAIROLI REPLICA we released some years ago, we wanted to honour Jeffrey’s achievements with the KTM 450 SX-F HERLINGS REPLICA. This model has a special specification with Herlings’ design and is a great package for European riders looking for the ultimate READY TO RACE machine,” commented Joachim Sauer, KTM Senior Product Manager Offroad.